A new European Horizon2020 project called OPTIMA, in which AGENSO is a project partner, has officially started at 01/09/2018. OPTIMA will contribute significantly to the reduction of the European agriculture reliance on chemical PPPs resulting in reduced use of agrochemicals, lower residues and reduced impacts on human health. 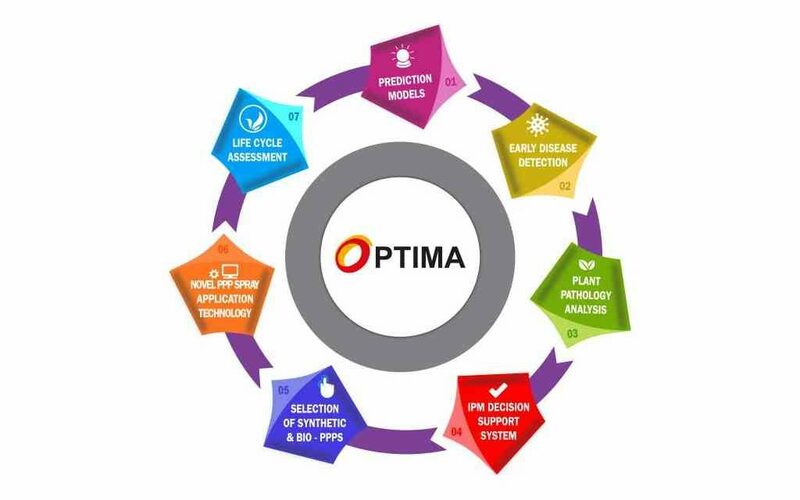 OPTIMA will optimize disease prediction models for downy mildew in vineyards, apple scab in apple orchards and alternaria leaf blight in carrots to envisage faster the possibility of disease outspread and developing advanced early detection methods based on spectral imaging and deep learning techniques to precisely localise and quantify the infection. It will evaluate and screen biological and synthetic PPPs for their combined ability to control the selected diseases and weigh the optimum dosage and application timing and identifying and characterize induced host resistance mechanisms to achieve higher and durable resistance. It will enhance and develop three innovative prototype sprayers (for carrots, apple orchards and vineyards) actuating different nozzle types and adopting variable rate control based on canopy characteristics, the pathogen dispersal and disease development. The holistic developed IPM system will be tested and assessed in field conditions with the three selected crops. The advanced sprayer prototypes and the monitoring system will be tested in real-time to record field efficacy and potential discrepancies from the expected effectiveness. OPTIMA will finally, assess health, environmental and socioeconomic impacts of the proposed IPM system in comparison to conventional systems using an extended Life-Cycle approach integrated with Human and Environmental Risk Assessment. AGENSO in this project is responsible for the design, development and integration of an innovative Decision Support System (DSS), using advanced agro-climatic and biological algorithms and geostatistical methods, able to predict and detect various types of diseases fusing different sources of data.